The WSTA would like to welcome Branch Instructor Jeff Dwyer 3rd Dan Black Belt to the art of Shim Jang Taekwondo, Jeff is a highly experienced instructor, he resides on the Gold Coast and he looks forward to an exciting future with Shim Jang Taekwondo. This edition of the “Shimjanger” will see the introduction of what we hope will be a regular part of my column – “My Instructor” This can only happen with YOUR assistance so we ask you to interview your Branch Instructor and submit the interview to us for inclusion in our new segment ! Q. Master Steve, where is your Centre. Q. What is your rank. Q. When did you commence your training. A. I started training in the early 1980’s, was promoted to Black Belt in 1988 and I moved to the Gold Coast in the mid 1990’s. I commenced training with Master Hicks soon after arriving on the coast and we decided to open a centre at Mermaid Beach, after about a year we transferred the class to Burleigh Heads where it has now been operating for over 15 years. Q. Do you have an Assistant Instructor. 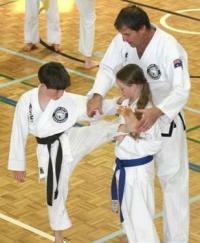 Both Instructors are very generous with their time and they are totally committed to the art of Shim Jang Taekwondo. Q. What is your favourite technique. Q. Are you Married ? A. Yes I am Married with 3 grown children. Q. What do you do for a living. A. I am an Elevator Technician here on the Gold Coast. Q. What is your favourite TV show. Q. What do you do in your spare time. A. Surf, follow the NRL (go the Dragons), I work on my home & I’m a bit of a computer geek ! Q. Do you have a favourite quote. Q. What type of music do you like.